In December, on the fringe of western art historical canons and on the fringe of high art, I wandered the stacks of our university library: the place in the shelves where the books tip toward craft and often “othered” continents. I found Heavenly Art, Earthly Beauty: Art of Islam and opened the book to this image. I was stunned by its beauty and clarity and imperfections. I have an intuition that this object is at the crux of what a textile poetics might be. “Carried on additional wefts,” a float weave is an extra weft, an add-on, and is not integral to the body of the fabric, yet, as I understand the process, it is made at the same time. It is a supplementary weave, running across, resulting from the work of a second shuttle, controlled by the same weaver at work on the substrate. So there are two drafts—(drafts are those gridded sketches that weavers use to plot out a pattern)—present in this weaver’s design: the simple warp and weft of the substrate, the most basic weave structure. It is likely that this weaver did not need to sketch this basic weave pattern out into draft form. But what pattern of over and under would build this word, again and again, floating across? There had to have been an additional draft drawn up to repeat the word. And so, a double pattern. I am thinking of Agnes Martin’s canvases: the grid or draft shows through a wash of paint applied over top in either horizontal or vertical brush strokes. Or if the underlying pattern creates horizontal bands, her paint alternates colors: an alternating draft. The intensity of grid atop grid. I imagine the act of weaving: after the first two rows, the float weave draft likely becomes mapped into the muscle memory of the weaver and a draft is no longer needed. Weaving, the double draft is inscribed in the body. Thinking as a writer and writing teacher, what is the meaning of this doubling? Possible answers: this doubling makes more than one subjectivity visible. There is more than one source of information and they are not necessarily at odds. They both show. And if this north African textile is writing, it is somatic, and the writing becomes unconscious, but only to an extent—because what is written may be the most important and mysterious word in this weaver’s life and to execute the pattern, close attention must be paid. This is where care and auspiciousness comes in: the word remains intact and doesn’t dissolve or get abstracted into pure gesture—as in Cy Twombly’s marks whose intensity begins as the word is left behind for pure gesture, abstraction. I am wondering if a default compositional move for the artist attuned to and trained in the western and secular arts is to progress the pattern forward or innovate the pattern rather than stay in one place with one word at a time. I am not exactly sure, writing this, what staying in place means as a writer. But I think that even John Cage’s advice that if something is boring an artist should do it again and again is rooted in a contrast to learned western traditions and the irony of that rebellious gesture. Is there any way out of that relativism? A textile poetics, rooted in craft and, in the case of this Islamic work, rooted in acts and artifacts of worship, takes on repetition without what I might call the baggage of boredom or irony. The sign stays the same; the one who makes is the one who is propelled into new realms, meanings. 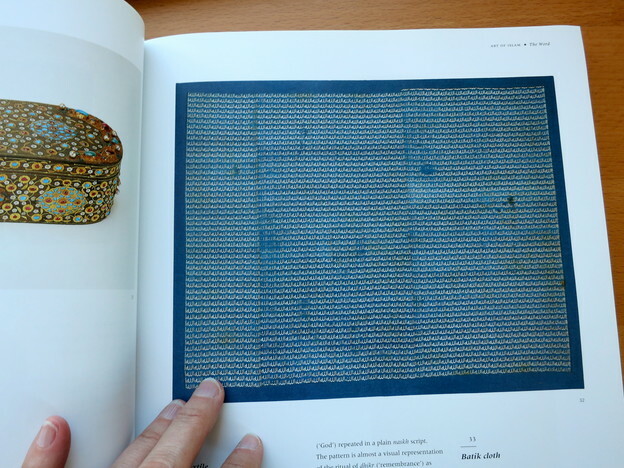 Back to my question about abstraction and writing: I would like to think through textiles in order to extend the “writer as copyist” idea beyond current “conceptual poetry” compositional moves where detachment, boredom, and the banal are highlighted. In that vein, I am thinking of Jen Hofer’s work in one, where I read a maximalist arrangement of citation as a supplementary weft, a float weave upon which we could say the substrate or the basic weave structure underneath is history, war, and the news. There is a weaver’s draft texture to these poems: most start in a similar fashion, and the emphasis, as we read, is on arrangement, not originality of voice. I also read no attempt to drain any of the language of its urgency, to move the work into boredom, nihilism, exhaustion, or hopelessness. There is catharsis at work in this poem, but it is not away from the meaning of the words: to me, the repetition is intent on going deeper and not abandoning or stylizing content. I am also thinking of Jesse Seldess’ work in Left Having, whose pages are certainly more sparse than Hofer’s, but whose draft structure performs variation as it goes. The substrate here, upon which the words float, is blankness. Not, to me, “white space” which implies something only in relation to words—but blankness as a state of being, of mind, even of thinking, and a state that impinges on text in much more than decorative ways or page layout impact. Reading, I am not sure if it is the blankness speaking to me or the inked words. Perhaps this is a poetics not unlike the float weave: background and foreground, context and text, substrate and pattern in simultaneous co-creation. Below is an image of an embroidery pattern I traced out from my handwriting, of a word, on the advice of Gilles Deleuze, that has become totally necessary for me to invoke as I enter built and landscaped space. I repeat “and” as I stitch, as I walk, as I go to the job site, as I enter my studio. The embroidery will be red, to match the substrate, to further the idea of text as “touch” instead of “print,” as I think black thread would indicate. The chalky pattern lines will be washed out when the piece is finished. From a distance it may be illegible.